As robotics technology evolves, we believe that personal social robots will be one of the next big expansions in the robotics sector. Based on the accelerated advances in this multidisciplinary domain and the growing number of use cases, we can posit that robots will play key roles in everyday life and will soon coexist with us, leading all people to a smarter, safer, healthier, and happier existence. The Pepper robot, developed by SoftBank Robotics, is one such robot created with the goal of achieving this vision. This article aims to present the insights derived from the design and applications of this machine and illustrate some of the use cases and research projects involving SoftBank Robotics to better understand the companion relationship between human and robot achievable through Pepper. We conclude by outlining some of the grand challenges ahead for research and development (R&D). Robots are becoming useful parts of the education ecosystem with their various capabilities ranging from the ability to perceive people and their environment to the ability to reason and rationalize situations and emotions of people. These robots are also equipped with multimodal interaction capabilities and, equally important, have a physical presence. Humanoid robots, with their humanlike appearance, add another dimension of humanlike body language and social signaling capabilities: keys for more natural and intuitive human-robot interaction. This chapter presents the applications of humanoid robots in education. The aim of this chapter is not to provide a complete review of all ongoing research works in robot-in-the-loop education but to create awareness about various educationally oriented applications of humanoid robots. The chapter will also discuss the set of the key capabilities such robots should possess, some major R&D challenges, and some ethical and social issues. Therefore, the chapter aims to serve as basis for further investigation for the interested readers. We are evolving, so as our society, lifestyle and the needs. AI and ICT have been with us for decades, and now penetrating more in our day-to-day life, so as the robots. But, where are all these converging together? Towards creating a smarter eco-system of living, where robots will coexist with us in harmony, for a smarter healthier, safer and happier life. Such robots have enormous potential to play essential roles in our everyday life, such as in scenarios like companionship, child care, educational, special educational, edutainment, healthcare, and co-worker robots. The question is How? The answer will be the Social Intelligence (SI) of the robots. SI of such consumer Robots will be the key technology and the next big R&D challenge at the cross-section of robotics, AI and cognition. SI will enable such robots to behave in socially expected and accepted manners. However there are still various technological and scientific constraints that end-users, robot providers and other involved stakeholders face, which prevent social robots from entering the market with full potential. There is a great need to create common ground and shared understanding about social robots, its potentials and applications, and the barriers. For the long term success of such robots is a need for these robots to behave in socially accepted and expected ways. In this regard, connectivity, learning and collective intelligence are some of the key building blocks. In recent years, it has been suggested that social robots have potential as tutors and educators for both children and adults. While robots have been shown to be effective in teaching knowledge and skill-based topics, we wish to explore how social robots can be used to tutor a second language to young children. As language learning relies on situated, grounded and social learning, in which interaction and repeated practice are central, social robots hold promise as educational tools for supporting second language learning. This paper surveys the developmental psychology of second language learning and suggests an agenda to study how core concepts of second language learning can be taught by a social robot. It suggests guidelines for designing robot tutors based on observations of second language learning in human--human scenarios, various technical aspects and early studies regarding the effectiveness of social robots as second language tutors. Tony Belpaeme, Paul Vogt, Rianne van den Berghe, Kirsten Bergmann, Tilbe Göksun, Mirjam de Haas, Junko Kanero, James Kennedy, Aylin C Küntay, Ora Oudgenoeg-Paz, Fotios Papadopoulos, Thorsten Schodde, Josje Verhagen, Christopher D Wallbridge, Bram Willemsen, Jan de Wit, Vasfiye Geçkin, Laura Hoffmann, Stefan Kopp, Emiel Krahmer, Ezgi Mamus, Jean-Marc Montanier, Cansu Oranç, Amit K Pandey. Paladyn, Journal of Behavioral Robotics 8, no. 1 (2017): 18-38. For robots to coexist with us in harmony and be our companion, they should be able to explicitly reason about humans, their presence, the social and human-centered environment, and the social-cultural norms, to behave in socially expected and accepted manner. To develop such capabilities, from psychology, child developmental and human behavioral research, we can identify some of the key ingredients, such as the abilities to distinguish between self and others, and to reason about affordance, perspective taking, shared spaces, social signals, emotions, theory of mind, social situation, etc., and the capability to develop social intelligence through the process of social learning. Researchers across the world are working to equip robots with some of these aspects from diverse perspectives and developing various interesting and innovative applications. This special issue is intended to reflect some of those high-quality research works, results and potential applications. Planning Manipulation tasks in human-centered environment require reasoning beyond stability of grasp and placement by incorporating important aspects of human perspective. In this paper, we identify some basic constraints, which a human-centered dexterous manipulation task planner should take into account. Then we present some key system components of such task planner, followed by a generalized framework for task planning. We also show one instantiation of the framework and present results with different robots, in different situations for a set of different types of task, such as Show, Hide, Give, Make Accessible an object to human. In its lifetime, a robot should be able to autonomously understand the semantics of different tasks to effectively perform them in different situations. In this context, it is important to distinguish the meaning (in terms of the desired effect) of a task and the means to achieve that task. Our focus is those tasks in which one agent is required to perform a task for another agent, such as give, show, hide, make-accessible, etc. In this paper, we identify that a high-level human-centered combined reasoning, based on perspective taking, efforts and abilities analyses, is the key to understand semantics of such tasks. By combining these aspects, the robot infers sets of hierarchy of facts, which serve for analyzing the effect of a task. We adapt the explanation based learning approach enabling the task understanding from the very first demonstration and continuous refinement with new demonstrations. We argue that such symbolic level understanding of a task, which is not bound to trajectory, kinematics structure or shape of the robot, facilitates generalization to novel situations as well as ease the transfer of acquired knowledge among heterogeneous robots. Further, the knowledge of tasks at such human understandable level of abstraction will enrich the natural human–robot interaction. Lovotics, the relatively new direction of robotics research, aims to bring love, affection and friendship between the human and the robot. In this paper, we will discuss the key aspects and raise some basic questions, which must be addresses for designing a 'lovotics robot', which is expected to be capable of stimulating mutual love-like bond between the human and the robot. We must also be careful of not falling in the uncanny valley. Robots are expected to cooperate with humans in day-to-day interaction. One aspect of such cooperation is behaving proactively. In this paper we will enable our robots, equipped with visuo-spatial perspective-taking capabilities, to behave proactively based on reasoning ‘where’ its human partner might perform a particular task with different effort levels. For this, the robot analyzes the agents’ abilities not only from the current state but also from a set of different states the agent might attain. Depending on the task and the situation, the robot exhibits different types of proactive behaviors, such as, reaching out, suggesting a solution and providing clues by head movement, for two different tasks performed by the human partner: give and make accessible. These proactive behaviors are intended to be informative to reduce confusion of the human partner, to communicate the robot’s ability and intention and to guide the partner for better cooperation. We have validated the behaviors by user studies, which suggest that such proactive behaviors reduce the ‘confusion’ and ‘effort’ of the users. Further, the participants reported the robot to be more ‘supportive and aware’ compared to the situations where the robot was non-proactive. Such proactive behaviors could enrich multi-modal interaction and cooperation capabilities of the robot as well as help in developing more complex socially expected and accepted behaviors in the human centered environment. Navigation is a basic skill for autonomous robots. In the last years human-robot interaction has become an important research field that spans all of the robot capabilities including perception, reasoning, learning, manipulation and navigation. For navigation, the presence of humans requires novel approaches that take into account the constraints of human comfort as well as social rules. Besides these constraints, putting robots among humans opens new interaction possibilities for robots, also for navigation tasks, such as robot guides. This paper provides a survey of existing approaches to human-aware navigation and offers a general classification scheme for the presented methods. ©All the images of robots are the copyright of the respective companies. We, the Humans, are capable of estimating various abilities of ourselves and of the person we are interacting with. Visibility and reachability are among two such abilities. Studies in neuroscience and psychology suggest that from the age of 12-15 months children start to understand the occlusion of others line-of-sight and from the age of 3 years they start to develop the ability, termed as perceived reachability for self and for others. As such capabilities evolve in the children, they start showing intuitive and proactive behavior by perceiving various abilities of the human partner. Inspired from such studies, which suggest that visuo-spatial perception plays an important role in Human-Human interaction, we propose to equip our robot to perceive various types of abilities of the agents in the workspace. The robot perceives such abilities not only from the current state of the agent but also by virtually putting an agent into various achievable states, such as turn left, stand up, etc. As the robot estimates what an agent might be able to ‘see’ and ‘reach’ if will be in a particular state, we term such analyses as Mightability Analyses. Currently the robot is equipped to perform such Mightability analyses at two levels: cells in the 3D grid and objects in the space, which we termed as Mightability Maps (MM) and Object Oriented Mightabilities (OOM) respectively. We have shown the applications of Mightability analyses in performing various co-operative tasks like show and make an object accessible to the human as well as competitive tasks like hide and put away an object from the human. Such Mightability analyses equip the robot for higher-level learning and decisional capabilities as well as could facilitate the robot for better verbalize interaction and proactive behavior. Local localization of a fully autonomous mobile robot in a partial map is an important aspect from the view point of accurate map building and safe path planning. The problem of correcting the location of a robot in a partial map worsens when sonar sensors are used. When a mobile robot is exploring the environment autonomously, it is rare to get the consistent pair of features or readings from two different positions using sonar sensors. So the approaches, which rely on readings or features matching, are prone to fail without exhaustive mathematical calculations of sonar modeling and environment modeling. This paper introduces link graph based robust two step feature chain based localization for achieving online SLAM (Simultaneous Localization And Mapping) using sonar data only. Instead of relying completely on matching of feature to feature or point to point, our approach finds possible associations between features to localize. The link graph based approach removes many false associations enhancing the SLAM process. We also map features onto Occupancy Grid (OG) framework taking advantage of its dense representation of the world. Combining features onto OG overcomes many of its limitations such as the independence assumption between cells and provides for better modeling of the sonar providing more accurate maps. A central component of the human self is the narrative history of shared interactions with others, which provides the foundation for social relations that develop over extended time. The loss of this narrative self progressively becomes catastrophic for aging subjects with degenerative disease of the memory system. A prosthetic device for narrative memory can provide an at least temporary solution to this problem. We identify requirements for a narrative memory capability that can allow individuals with diminished memory to continue to interact socially with partners with whom they have shared experiences. A memory prosthetic should provide access to past memories of the subject, and should accompany the subject in the formation, organization and retrieval of new memories. Based on these requirements, we have implemented the V1.0 narrative memory companion on the Pepper humanoid robot using the native Choregraph and NAOqi system capabilities. We exploit principals developed in our research in autobiographical memory and the organization of experience in cooperative humanoid robots, and the mapping of narrative structure onto this experience. In the narrative companion, past memories are first collected from the subject or members of their entourage via a template-based interview, and a small number of photographs that illustrate important people and events in the subject's past. New memories constructed via interaction with Pepper, and by simple narratives told by the human partner, are stored in the Autobiographical Memory (ABM) implemented in the ALKnolwedge base of the NAOqi system. Memories are then recalled and shared by narrative. Results from a naïve case study are presented, and future applications for improved quality of life are discussed. Allowing humans to teach robot behaviors will facilitate acceptability as well as long-term interactions. Humans would mainly use speech to transfer knowledge or to teach highlevel behaviors. In this paper, we propose a proof-of-concept application allowing a Pepper robot to learn behaviors from their natural-language-based description, provided by naive human users. In our model, natural language input is provided by grammar-free speech recognition, and is then processed to produce semantic knowledge, grounded in language and primitive behaviors. The same semantic knowledge is used to represent any kind of perceived input as well as actions the robot can perform. The experiment shows that the system can work independently from the domain of application, but also that it has limitations. Progress in semantic extraction, behavior planning and interaction scenario could stretch these limits. Cultural competence is a well known requirement for an effective healthcare, widely investigated in the nursing literature. We claim that personal assistive robots should likewise be culturally competent, aware of general cultural characteristics and of the different forms they take in different individuals, and sensitive to cultural differences while perceiving, reasoning, and acting. Drawing inspiration from existing guidelines for culturally competent healthcare and the state-of-the-art in culturally competent robotics, we identify the key robot capabilities which enable culturally competent behaviours and discuss methodologies for their development and evaluation. Robots are becoming commonplace. They are also becoming capable of learning. Combination of these, from one perspective, might also be problematic. What if someone teaches a robot some ‘bad’ things? As a precautionary measure robot could be pre-programmed to not learn a list of ‘bad’ things. But on the other side robots will have to be programmed for supporting the privacy of the people. What if someone uses the ‘privacy’ channel to teach ‘bad’ things, and as bad as making the robot to be part of supporting even potentially unethical and immoral behaviors? This paper illustrates such possibilities through a simple human-robot interaction based robot learning system. The aim is to proactively fetch the attention of the community towards such possible future threats and how to address those scientifically. The presented system is part of an ongoing study about how people expect a social robot to behave if there is a dilemma of Privacy vs. Moral, Social and Ethical accountability. For effective Human-Robot Interaction (HRI), a robot should be human and human-environment aware. Perspective taking, effort analysis and affordance analysis are some of the core components in such human-centered reasoning. This paper is concerned with the need for benchmarking scenarios to assess the resultant intelligence, when such reasoning blocks function together. Despite the various competitions involving robots, there is a lack of approaches considering the human in their scenarios and in the reasoning processes, especially those targeting HRI. We present a game that is centered upon a human-robot competition, and motivate how our scenario, and the idea of a robot and a human competing, can serve as a benchmark test for both human-aware reasoning as well as inter-robot social intelligence. Based on subjective feedback from participants, we also provide some pointers and ingredients for evaluation matrices. MuMMER (MultiModal Mall Entertainment Robot) is a four-year, EU-funded project with the overall goal of developing a humanoid robot (SoftBank Robotics’ Pepper robot being the primary robot platform) with the social intelligence to interact autonomously and naturally in the dynamic environments of a public shopping mall, providing an engaging and entertaining experience to the general public. Using co-design methods, we will work together with stakeholders including customers, retailers, and business managers to develop truly engaging robot behaviours. Crucially, our robot will exhibit behaviour that is socially appropriate and engaging by combining speech-based interaction with non-verbal communication and human-aware navigation. To support this behaviour, we will develop and integrate new methods from audiovisual scene processing, social-signal processing, high-level action selection, and human-aware robot navigation. Throughout the project, the robot will be regularly deployed in Ideapark, a large public shopping mall in Finland. This position paper describes the MuMMER project: its needs, the objectives, R&D challenges and our approach. It will serve as reference for the robotics community and stakeholders about this ambitious project, demonstrating how a co-design approach can address some of the barriers and help in building follow-up projects. A Novel Concept of Human-Robot Competition for HRI Reasoning: Where Does It Point? ​For intelligent Human-Robot Interaction (HRI), a robot should be equipped with some core reasoning capabilities such as perspective taking, effort analysis, and affordance analysis. This paper starts to explore how a robot equipped with such reasoning abilities could be evaluated. To this end, inspired by the Turing test, we design a game involving a human-robot competition scenario. Interestingly, the participants' subjective feedback, which tended to compare the robot's abilities with their own, points toward potential criteria for developing benchmark scenarios and evaluation matrices. Affordance, being one of the key building blocks behind how we interact with the environment, is also studied widely in robotics from different perspectives, for navigation, for task planning, etc. Therefore, the study is mostly focused on affordances of individual objects and for robot environment interaction, and such affordances have been mostly perceived through vision and physical interaction. However, in a human centered environment, for a robot to be socially intelligent and exhibit more natural interaction behavior, it should be able to learn affordances also through day-to-day verbal interaction and that too from the perspective of what does the presence of a specific set of objects affords to provide. In this paper, we will present the novel idea of verbal interaction based multi-object affordance learning and a framework to achieve that. Further, an instantiation of the framework on the real robot within office context is analyzed. Some of the potential future works and applications, such as fusing with activity pattern and interaction grounding will be briefly discussed. This paper introduces a research effort to develop and evaluate social robots for second language tutoring in early childhood. The L2TOR project will capitalise on recent observations in which social robots have been shown to have marked benefits over screen-based technologies in education, both in terms of learning outcomes and motivation. As language acquisition benefits from early, personalised and interactive tutoring, current language tutoring delivery is often ill-equipped to deal with this: classroom resources are at present inadequate to offer one-to-one tutoring with (near) native speakers in educational and home contexts. L2TOR will address this by furthering the science and technology of language tutoring robots. This document describes the main research strands and expected outcomes of the project. For a socially intelligent robot, different levels of situation assessment are required, ranging from basic processing of sensor input to high-level analysis of semantics and intention. However, the attempt to combine them all prompts new research challenges and the need of a coherent framework and architecture. This paper presents the situation assessment aspect of Romeo2, a unique project aiming to bring multi-modal and multi-layered perception on a single system and targeting for a unified theoretical and functional frame- work for a robot companion for everyday life. It also discusses some of the innovation potentials, which the combination of these various perception abilities adds into the robot’s socio-cognitive capabilities. Analyzing affordances has its root in socio-cognitive development of primates. Knowing what the environment, including other agents, can offer in terms of action capabilities is important for our day-to-day interaction and cooperation. In this paper, we will merge two complementary aspects of affordances: from agent-object perspective, what an agent afford to do with an object, and from agent-agent perspective, what an agent can afford to do for other agent, and present a unified notion of Affordance Graph. The graph will encode affordances for a variety of tasks: take, give, pick, put on, put into, show, hide, make accessible, etc. Another novelty will be to incorporate the aspects of effort and perspective-taking in constructing such graph. Hence, the Affordance Graph will tell about the action-capabilities of manipulating the objects among the agents and across the places, along with the information about the required level of efforts and the potential places. We will also demonstrate some interesting applications. While symbolic planners work with an abstract representation of the real world, allowing plans to be constructed relatively quickly, geometric planning - although more computationally complex - is essential for building symbolic plans that actually work in the real world. To combine the two types of systems, we present in this paper a meaningful interface, and insights into a methodology for developing interwoven symbolic-geometric domains. We concretely present this “link” between the two approaches with algorithms and data structures that amount to an intermediate layer that coordinates symbolic-geometric planning. Since both planners are capable of “backtracking” at their own levels, we also investigate the issue of how to interleave their backtracking, which we do in the context of the algorithms that form the link. Finally, we present a prototype implementation of the combined system on a PR2 robot. 1. Perspective Taking: Reasoning about abilities to reach and see some place or object from others’ perspective. These are central for deciding the “what”, “where” and “how” aspects of joint action. 2. Affordance and Effort Analysis: Reasoning about “what” an agent can afford to do with an object and for other agents, and with “which” effort levels. These are important for planning joint actions. 3. State Analysis: Analyzing the current physical state of an agent, e.g. whether holding something or free, looking around, or focusing on something. These are important for executing and monitoring a joint action. 4. Planning Basic Joint Tasks: Planning day-to-day tasks, e.g. giving, showing, or hiding some object, by taking into account how to grasp the object so that the other agent can take it, how to hold/place it so that the other agent can recognize it. These are important for the success of the joint action. 5. Proactivity for Joint Tasks: For common tasks like ‘give’ or ‘make accessible’, it helps if the receiver agent proactively reaches out to take, or suggest where to put. We found that such proactive behaviors reduce the effort and confusion of the human partner in the joint action. We claim that these altogether greatly elevates the robot’s collaborative and joint task planning and executing capabilities towards being socially acceptable. In this paper we present an interface between a symbolic planner and a geometric task planner, which is different to a standard trajectory planner in that the former is able to perform geometric reasoning on abstract entities---tasks. We believe that this approach facilitates a more principled interface to symbolic planning, while also leaving more room for the geometric planner to make independent decisions. We show how the two planners could be interfaced, and how their planning and backtracking could be interleaved. We also provide insights for a methodology for using the combined system, and experimental results to use as a benchmark with future extensions to both the combined system, as well as to the geometric task planner. Affordance analysis, what something/someone can afford or offers, is an important aspect for day-to-day interaction and decision-making. In this paper, we will enrich the notion of affordance by incorporating agent-agent affordance: what does an agent afford for another agent in terms of a task. Further, we will present an effort hierarchy and derive the concept of Taskability Graph, which encodes: what all agents could do for all other agents, with which levels of mutual-efforts and at which places. This makes the robot more aware about agents' abilities and facilitates to develop better interaction and decision-making capabilities. We will discuss the potential application in effort based shared cooperative planning. For the long term co-existence of robots with us in complete harmony, they will be expected to show socio-cognitive behaviors. In this paper, taking inspiration from child development research and human behavioral psychology we will identify the basic but key capabilities: perceiving abilities, effort and affordances. Further we will present the concepts, which fuse these components to perform multi-effort ability and affordance analysis. We will show instantiations of these capabilities on real robot and will discuss its potential applications for more complex socio-cognitive behavior. In a typical Human-Robot Interaction (HRI) scenario, the robot needs to perform various tasks for the human, hence should take into account human oriented constraints. In this context it is not sufficient that the robot selects grasp and placement of the object from the stability point of view only. Motivated from human behavioral psychology, in this paper we emphasize on the mutually depended nature of grasp and placement selections, which is further constrained by the task, the environment and the human's perspective. We will explore essential human oriented constraints on grasp and placement selections and present a framework to incorporate them in synthesizing key configurations of planning basic interactive manipulation tasks. International Joint Conference on Artificial Intelligence-Workshop on Agents Learning Interactively from Human Teachers (ALIHT, IJCAI 2011). For a lifelong learning robot, in the context of task understanding, it is important to distinguish the ‘meaning’ of a task from the ‘means’ to achieve it. In this paper we will select a set of tasks in a typical Human-Robot interaction scenario such as show, hide, make accessible, etc., and illustrate that visuo-spatial perspective taking can be effectively used to understand such tasks’ semantics in terms of ‘effect’. The idea is, for understanding the ‘effects’ the robot analyzes the reachability and visibility of an agent not only from the current state of the agent but also from a set of virtual states, which the agent might attain with different level of efforts from his/its current state. We show that such symbolic understandings of tasks could be generalized to new situations or spatial arrangements, as well as facilitate 'transfer of understanding’ among heterogeneous robots. Robot begins to understand the semantics of the task from the first demonstration and continuously refines its understanding with further examples. Robots are expected to co-operate with humans in day-to-day interaction. One aspect of such co-operation is behaving proactively. In this paper, our robot will exploit the visuo-spatial perspective-taking of the human partner not only from his current state but also from a set of different states he might attain from his current state. Such rich information will help the robot in better predicting `where' the human can perform a particular task and how the robot could support it. We have tested the system on two different robots for the tasks of giving and making an object accessible to the robot by the human partner. Our robots equipped with such multi-state visuo-spatial perspective-taking capabilities show different proactive behaviors depending upon the task and situation, such as reach out proactively and to a correct place, when human has to give an object to the robot. Primary results of user studies show that such proactive behaviors reduce the human's `confusion' as well as `the robot' seems to be more `aware' about the task and the human. Interestingly Humans are able to maintain rough estimations of visibility, reachability and other capabilities of not only themselves but of the person they are interacting with. Studies in neuroscience and psychology suggest that from the age of 12-15 months children start to understand the occlusion of others line-of-sight and from the age of 3 years they start to develop the ability, termed as perceived reachability for self and for others. As such capabilities evolve in the children, they start showing intuitive and proactive behavior by perceiving various abilities of the human partner. Inspired from such studies, which suggest that visuo-spatial perception plays an important role in Human-Human interaction, we propose to equip our robot with the capabilities to maintain various types of reachabilities and visibilities information of itself and of the human partner in the shared workspace. Since these analyses will be basically perceived by performing a virtual action onto the agent and roughly estimating what that agent might be able to 'see' and 'reach' in 3D space, we term these representations as Mightability Maps. By applying various set operations on Weighted Mightability Maps, robot could perceive a set of candidate solutions in real time for various tasks. We show its application in exhibiting two different behaviors of robot: co-operative and competitive. These maps are also quick to compute and could help in developing higher-level decisional capabilities in the robot. For a Mobile Robot to navigate in the Human-Centered environment without imposing alien like impression by its motion, it should be able to reason about various criteria ranging from clearance, environment structure, unknown objects, social conventions, proximity constraints, presence of an individual or group of peoples, etc. Also the robot should neither be over-reactive nor be simple wait and move machine. We have adapted a Voronoi diagram based approach for the analysis of local clearance and environment structure. We also propose to treat human differently from other obstacles for which the robot constructs different sets of regions around human and iteratively converges to a set of points (milestones), using social conventions, human proximity guidelines and clearance constraints to generate and modify its path smoothly. Once equipped with such capabilities, robot is able to do higher-level reasoning for dynamic and selective adaptation of social convention depending upon the environment segment. It also leads the robot to be aware about its own motion behavior. It is now well known that while symbolic task planners have been drastically improved to solve more and more complex symbolic problems the difficulty of successfully applying such planners to robotics problems still remains. Indeed, in such planners, actions such as “navigate” or “grasp” use abstracted applicability situations that might result in finding plans that cannot be refined at the geometrical level. This is due to the gap between the representation they are based on and the physical environment (see the pioneering paper (Lozano-Perez, Jones, and Mazer 1987)). In this paper, we extend this approach and apply it to the challenging context of human-robot cooperative manipulation. We propose a scheme that is still based on the coalition of a symbolic planner (Alili et al. 2009) and a geometric planner (Pandey and Alami 2010; Sisbot, Marin Urias, and Alami 2007; Marin Urias, Sisbot, and Alami 2008) but which provides a more elaborate interaction between the two planning environments. Explicitly showing the robot’s knowledge about the states of the world and the agents’ capabilities in such states is essential in human robot interaction. This way, the human partner can better understand the robot’s intentions and beliefs in order to provide missing information that may eventually improve the interaction. We present our current approach for modeling the robot’s knowledge from a symbolic point of view based on an ontology. This knowledge is fed by two sources: direct interaction with the human, and geometric reasoning. We present an interactive task scenario where we exploit the robot’s knowledge to interact with the human while showing its internal geometric reasoning when possible. Interestingly in different situations, human not only plans differently for approaching, accompanying, passing by and avoiding another person, but also smoothly maintains an appropriate distance. But for a mobile robot it is not trivial at all, while also maintaining its goal. In this paper we present a generic framework of mobile robot path planning for adapting social rules at different states of execution, which apart from assuring safety, also respects the comfort and expectations of human, and convey its intention to human well in advance. 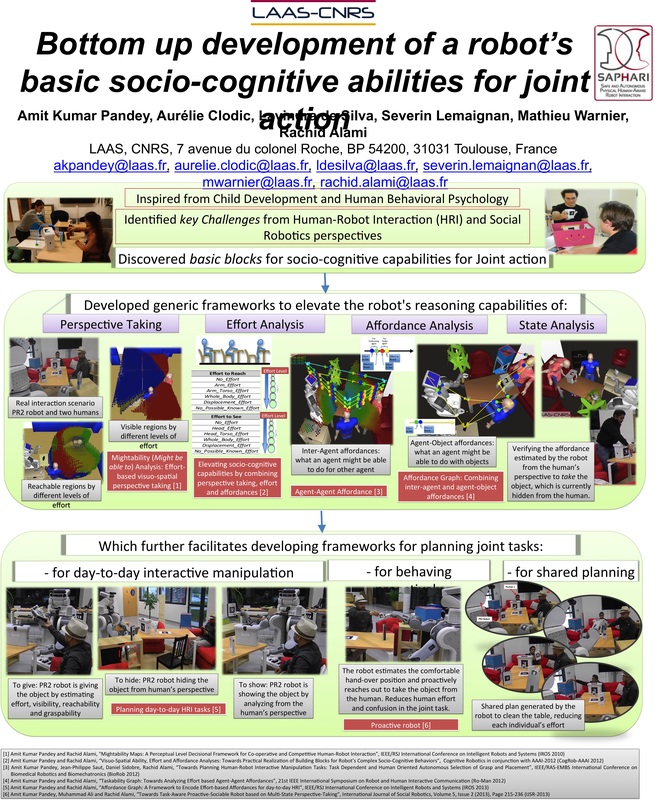 In our approach for treating human explicitly robot constructs different sets of regions around human and iteratively converges to a set of points (milestones), using social rules, human proximity rules and task oriented rules to generate a smooth path. We have compared our results with the case, when robot is purely reactive. This paper presents a framework for a mobile robot guide, which provides the human with the flexibility to decide upon the way he wants to be guided. During the guiding process at any instant, the exploratory nature of the human, the social behavior and the individual's desires contribute to the position of the person with respect to the robot. For a robot to behave socially, it should not expect that the human will always follow the exact trajectory of the robot or will always maintain a fixed distance with robot. Depending upon the human's will and desire, he can choose either to accompany or to follow the robot during the guiding. To give more privilege to human, robot should also not expect that human will always support the guiding. Human may temporarily suspend the joint commitment of guiding process, due to other interesting tasks and may completely abandon the path expected by robot. Also sometimes the structure of the environment could enforce separation or hide the human. As a ‘social’ guide, robot should not only tolerate human diverse behavior but also try to adapt its path to support the human activity as well as influence the human path towards the goal. It should take appropriate decisions about when, where and how to deviate, as the very frequent or unnatural maneuvers of robot will make the human feel uncomfortable. In this paper we present a framework of monitoring and adapting to the human commitment on the joint task, and carrying out appropriate and goal oriented re-engagement attempts, if required, from the view point of guiding. This paper presents a methodology for integrating features within the occupancy grid (OG) framework. The OG maps provide a dense representation of the environment. In particular they give information for every range measurement projected onto a grid. However independence assumptions between cells during updates as well as not considering sonar models lead to inconsistent maps, which may also lead the robot to take some decisions which may be unsafe or which may introduce an unnecessary overhead of run-time collision avoidance behaviors. Feature based maps provide more consistent representation by implicitly considering correlation between cells. But they are sparse due to sparseness of features in a typical environment. This paper provides a method for integrating feature based representations within the standard Bayesian framework of OG and provides a dense, more accurate and safe representation than standard OG methods.